The system records every shot a golfer makes, analyzes the data in real time and reveals strengths and weaknesses to enhance on-course decision-making. 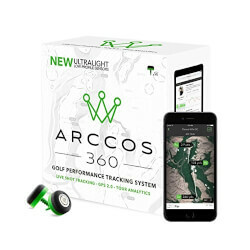 Hands-free shot mapping combined with rangefinder distances in yards or meters to any point on more than 40,000 courses. Tour analytics breaks down a players' handicap into five key components - driving, approach, chipping, sand game and putting. Low profile sensors are more than 50 percent smaller and lighter than the original arccos system. With. Allows users to play rounds in airplane mode, dramatically reducing phone battery drain and eliminating data roaming during international travel.